The World Intellectual Property Organization today released its first report on artificial intelligence showing a sharp rise in patenting activities over the last few years. WIPO Director General Francis Gurry called artificial intelligence a “game changer” during a press briefing yesterday and said WIPO hopes to spark a conversation on the issue among its member states this year. As in most other fields, leading patent offices are the United States and China. 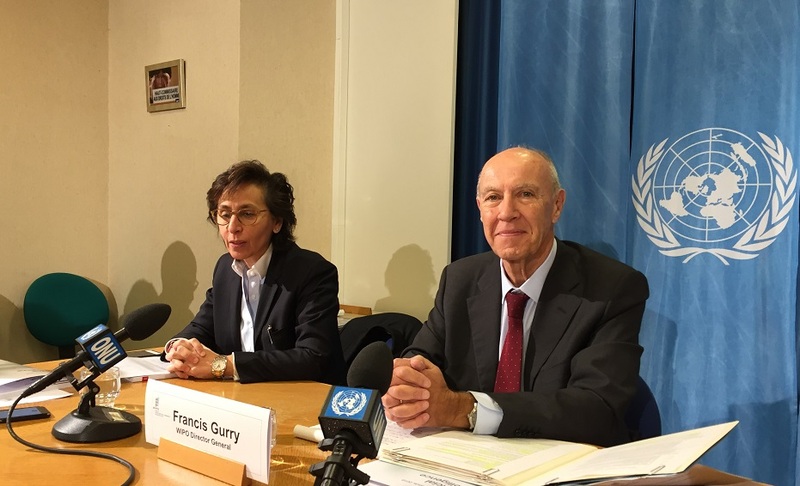 WIPO Director General Francis Gurry at the UN Palais press briefing yesterday. To his right, WIPO press officer Samar Shamoon. US companies IBM and Microsoft are leaders in patenting of artificial intelligence-related inventions, and China leads in scientific publications by a large margin. There is a need for the international community to talk about this seriously, he said, adding that data is highly mobile, and is not a national-level only question. AI-related patents are on the sharp rise since 2013, according to the report, with companies representing 26 out of the top 30 AI patent applicants, and one-third of all identified inventions relating to machine translation. “Patents are not perfect indicators but one of the best that we have,” he said, adding that data shows the extensive degree of penetration of AI in the commercial and industrial sector. AI technologies in the report are analysed according to three categories, he said: the techniques that are used; the functional applications; and their penetration across commercial and industrial sectors. Applications include networks, business, military, transportation, agriculture, entertainment, education, telecommunications, banking and finance, and life and medical sciences. The patent activity around AI-related applications arbitrates a debate which put into question the relevance of the traditional intellectual property system categories, which emerged with the industrial revolution for the new technological basis of the new economy, Gurry explained. The data is telling that the traditional IP system and patents are not going out of fashion, on the contrary, he added. AI is data and algorithms and much of the patenting is focuses on algorithms, according to Gurry, underlining the importance of issues around data, encompassing questions on security, integrity, on competition law and even property law. Asked about how AI applications are handled since AI an evolving technology, Gurry said currently patent offices are treating AI patent applications as any other computer-assisted innovation. The top 10 patent applicants by number of patent families are IBM (8,290 inventions), Microsoft (5,930) with for both companies, portfolios spanning through a range of AI techniques, applications and fields. They are followed by Toshiba, Samsung, NEC, Fujitsu, Hitachi, Panasonic, Canon, and Alphabet (including Google, DeepMind, Waymo and X Development). Alphabet ranks first in terms of acquisitions of AI companies, and. Apple and Microsoft have also been active in acquisitions. Some well-known companies that do not feature among the top overall players in AI patents are however leaders in certain areas, such as Facebook and Tencent in networks and social networks, according to the report. The top 10 filing offices are the United States, China, Japan, WIPO, the European Patent Office, South Korea, Germany, Canada, Australia, and India. Within machine learning, deep learning is the fastest growing technique in AI, the report says, and computer vision is the main functional application mentioned in patents by the top companies. The Chinese Academy of Sciences has the largest patent portfolio explicitly dealing with deep learning techniques, the reports says, adding that most of the main portfolios in deep learning have been filed by Chinese universities. According to the report, in transportation, the largest portfolios belong to auto manufacturers or suppliers from Asia or Europe, but Alphabet and IBM also have large portfolios mentioning transportation-related applications. Toyota leads in the sub-categories of autonomous vehicles, transportation or traffic engineering, and driver or vehicle recognition, while Boeing is the main patenting player in aerospace/avionics. The largest portfolios dealing with life and medical sciences belong to multinational companies also active in medical technology (Siemens, Philips and Samsung). Microsoft leads in cryptography, Samsung is first for authentication, and IBM leads in cybersecurity, detection and surveillance. Business applications are dominated by IBM and Microsoft, but Alphabet and Verizon also show strong patenting activity in this field, along with Toshiba and Alibaba for which all of the patents relate mainly to e-commerce. Social network patents are also owned by Facebook, Verizon and Tencent, while in electronic entertainment, companies such as Sony, Microsoft, Konami, Nintendo, and Disney have “fairly large” AI-related patent portfolios. According to Gurry, the prominence of internet giants in the US and China might be attributed in part to their large domestic data pools, with 1.3 billion people in China for example. The “hegemony” of the English language might also have favoured internet giants in the US, he said, and in Europe, the linguistic and cultural differences might not necessarily favour the emergence of large data pools. The report also looked into scientific publications to get a more accurate picture of trends in AI. The top 10 universities and public research organisations producing AI scientific publications, by number of articles are all Chinese: the Chinese Academy of Sciences, Tsinghua University, Chinese Ministry of Education, the Harbin Institute of Technology, Shanghai Jiao Tong University, Zhejiang University, Beihang University, Huazhong University of Science and Technology, Southeast University, and Wuhan University. Six American universities, two universities in Singapore, one in Japan, and one in France make it in the top 20 universities publishing AI scientific articles. "WIPO Sheds Light On Artificial Intelligence Patenting Trends In New Report" by Intellectual Property Watch is licensed under a Creative Commons Attribution-NonCommercial-ShareAlike 4.0 International License.